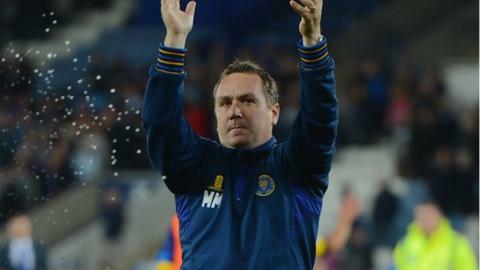 Shrewsbury Town manager Micky Mellon says knocking Championship side Blackburn Rovers out of the League Cup will give his League One club a huge boost of confidence. Goals from James Collins and Tyrone Barnett helped Town pull of a stunning 2-1 win at Ewood Park. "It was a complete performance," Mellon told BBC Radio Shropshire. "It wasn't a smash-and-grab and the lads will take enormous credit and confidence from it." Mellon added: "To come to a big place like Blackburn and get a result is very satisfying, the players can be very proud. "Our desire to defend our goal was fantastic - when our players have jobs to do, they do them." The Shrews lost their opening game back in League One, but Mellon thinks they now have something to build on. "I don't like getting beat and Saturday was a bit of a write-off," he added. "But to get that result will make the confidence flow through the team." Micky Mellon guided Shrewsbury, then in League Two, to the last 16 of the competition last season where they were narrowly beaten 2-1 by the eventual Premier League champions Chelsea. On the way, the Shrews knocked out Championship sides Blackpool and Norwich and top-flight Leicester City.